Bougainvillea (Bougainvillea spp.) is a vine known for its profusion of brightly-colored papery flower bracts in summer. It is a frost-sensitive species, but grows well in pots, allowing it to be brought indoors for winter. What appear to be bougainvillea's flowers are actually bracts, paper-textured husks that conceal a tiny true flower inside. 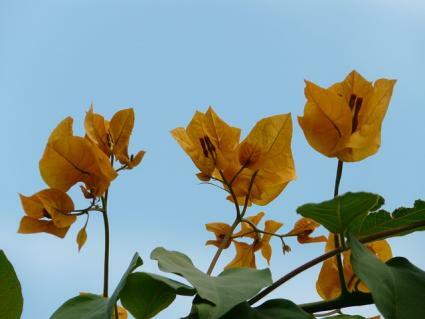 The bracts are roughly an inch in size and come in a variety of colors, including pink, cream, orange, purple, red, and the classic magenta color that is most associated with bougainvillea. The leaves are spade-shaped and about 3 inches long. The vines are stiff and woody and covered with large thorns. The overall height of the plant varies depending on the variety, but the basic species is capable of reaching 20 feet or more under ideal conditions. It's hardy in USDA zones 9 to 11. 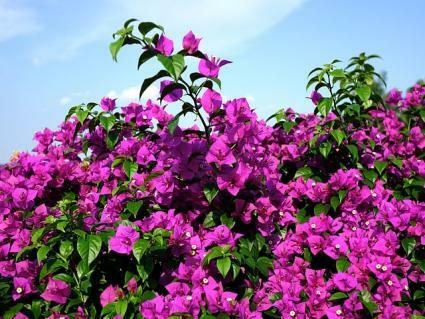 Bougainvillea is not considered toxic, but the stems contain a sap-like substance that can cause short term skin irritation if you are scratched by the thorns. Bougainvilleas need full sun and well-drained soil to grow and thrive. They flower best when the soil is not overly rich, so there is generally no need to fertilize or amend the soil with compost. The vines are quite drought-tolerant once established. Bougainvillea is often highlighted in Mediterranean- or Tuscan-themed landscaping schemes, where its colorful flowers compliment terra cotta pots and white-washed stucco walls. It's exuberant colors also make it well-suited to tropical-themed landscapes. Use it to cover walls, fences, arbors and pergolas. Dwarf varieties many be grown in hanging baskets. The plants do very well in pots and have even been used as bonsai specimens. Bougainvillea's dense, thorny growth habit make it a nearly impenetrable barrier when planted along a property line. Unlike most vines, its stems are stiff enough that it will become shrub-like if trimmed regularly as a hedge. Spring, after all danger of frost has passed, is the best time to plant bougainvillea. Bougainvillea is known for having very sensitive, brittle roots, so it's important to disturb them as little as possible when planting. Dig the hole the same depth as the root ball and twice as wide. Loosen the roots very gently so they are not confined to the shape of the pot and plant it, using a bit of compost only if the soil is very sandy or rocky. If the soil is poorly drained, plant bougainvillea on a slight mound to provide drainage. 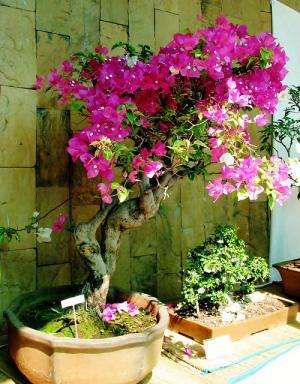 Bougainvillea is typically trained to grow on a vertical support structure. Because the stems lack tendrils to grab onto a trellis or fence, it needs a little help to get started. Plant the bougainvillea at the base of a trellis or other support structure and use heavy duty tree ties to tie the largest stems loosely to the structure. This is usually all that's needed because the vines will become interlaced as they grow, meaning they will be supported by the oldest vines that have been tied to the support structure. But if there is ever a loose vine, simply tie it to one of the secure vines or directly to the trellis. Water bougainvillea weekly for at least the first two years to establish a strong root system. Potted specimens will need water throughout their lives, usually every few days, depending on how hot it is. After flowering has stopped in fall, bougainvillea may be cut back to control its size. Otherwise, pruning is generally not needed. 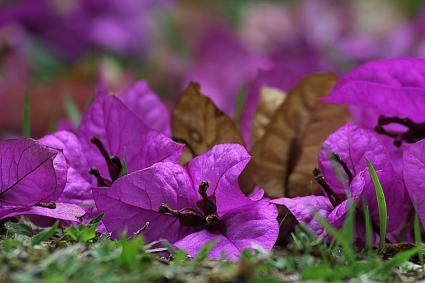 Bougainvillea can survive light frosts, but may lose all of its leaves and much of the top growth may die. Mulch the roots heavily in winter when growing bougainvillea near the edge of its range to keep them freezing and remove any dead aboveground portions of the plant in early spring. Well-established plants may sprout from the roots after a frost if cared for in this way. Plants brought indoors for winter should be kept in a sunny room and watered minimally. They will likely lose their leaves during this time, but these will re-grow as soon as the plant is brought outside again in spring. Bougainvillea is rarely troubled by pests and disease if cared for properly. Poorly drained soil and excessive irrigation can lead to fungal problems, like leaf spot. Sucking insects, like white flies and aphids, may occur, especially on highly fertilized plants. Control these insects with horticultural oil or an insecticidal soap if a severe infestation presents itself. Bougainvillea is widely available in nurseries throughout the country and has been bred into many unique cultivars. 'Barbara Karst' is a classic magenta variety that can grow up to 30 feet. 'California Gold' grows up to 30 feet and has pastel orange-yellow flower bracts. 'Raspberry Ice' is a dwarf form growing just a few feet tall and wide, with crimson colored bracts and variegated foliage. 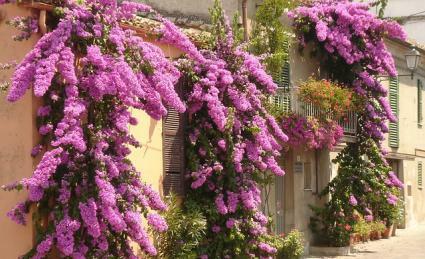 Bougainvilleas have an inherently festive appearance in the landscape. They appear to overflow with blossoms and can instantly brighten the ambiance of any sunny garden space.